With a Hotshots competition promised if the schedule produced an empty half day Friday, few fans outside Ontario were rooting for tie-breaks, However, Northern Ontario's final day loss to Nova Scotia and Ontario's loss to Manitoba meant that the two teams faced off this morning, pushing the Page games into the Hotshots slot this afternoon. 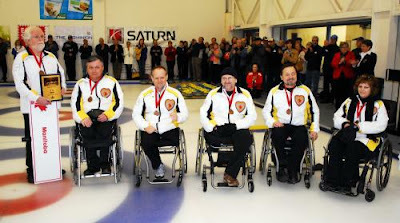 Ontario had chosen to bring four curlers and two coaches rather than an alternate, so when a medical issue arose for one of the team, there was the possibility that they might have to forfeit the game. Whether that unsettled Ontario, or whether it was just that for this week Northern Ontario had their number, they were never in the game. Northern Ontario took 2 with the hammer and then stole 2. A coach's time out failed to settle Ontario who continued to concede steals culminating in a 4 in the 7th and handshakes at 13-0. That set up a 3/4 Page playoff game between Northern Ontario and near neighbours Manitoba, a game that produced the best shot I've seen this week. Northern Ontario had opened an early 3-0 lead but fell behind when Manitoba stole in the 4th and 5th ends. In the 6th Manitoba were sitting shot behind a wall of rocks. With his final stone skip Wayne Ficek threw an angle raise that traveled at least 20 feet across the rings to dislodge the buried Manitoba stone, rescuing the end and probably the game. Manitoba gave up a steal in 7 and took 1 with hammer in the 8th and we went to an extra end. Though we live blogged the playoff game between BC and Alberta we were able to blog the extra end and you can read our calls below. Again Manitoba sat 1 buried and Northern Ontario were forced to peel guards, opening a small port to allow at least a chance to come down to shot It came down to a needed tap-back through a narrow port, with Manitoba sitting 1, but the final stone grazed a guard and came up short. It was a great game and both teams can be proud of a performance that kept the crowd cheering. Alberta and BC met for the second time in two days and today Alberta proved tougher opposition. BC had hammer and first choice of rocks, They took yellow from the adjoining sheet C while Alberta took blue rocks from that same sheet. BC took 1 in the first, and the stole singles to go up 3-0 after 3. Alberta responded with a 2 before the break and stole two singles to go ahead 4-3. BC tied it up in 7 and then stole 1 in the final end when Alberta skip Jack Smart made a valiant but doomed attempt at a triple raise to dislodge shot stone. The full live-blog account is below. BC looked vulnerable at several points during the Alberta game, and Alberta must feel that maybe three's a charm if they get past Manitoba in tomorrow's semi-final. They won their round robin match-up against Manitoba 6-5 on a steal of 1 in the 8th in Draw 4. Manitoba, with Chris Sobkowicz at skip, have been a steady team, winning by stringing together 1s and 2s rather than relying on big ends. They have also given up the fewest points of any team. Though they received a scare against Northern Ontario, they were not the team chasing at the end. BC will be happy to have the luxury of a late start, but if the final games are as exciting as today's Page playoffs, the crowd, and there has been a good crowd, are in for a treat. Please join us today at 3:30PM ADT for the Page Playoff. NONT will face Manitoba in the 3/4 game, and BC and Alberta meet again in the 1/2. Here are photos of today's skips, taken earlier in the week by Ian Readey. We have to crop these for the blog, and they are still great. View the spectacular originals on Ian's site. Join us today at 11:30 ADT for the Tiebreak, and again at 3:30 ADT for both Page games. There is only one tiebreaker, and it's a dandy -- NONT vs ONT. Join us at 11:30AM ADT. Don't forget the Page Playoff games later, scheduled for 3:30PM ADT. BC and Alberta will meet again in the 1/2 game, and Manitoba will play the winner of the tiebreaker in the 3/4 game. Check here later for the link to that event, but in the meantime, enjoy the Tiebreaker! 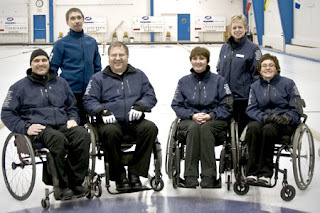 Judging by the comments on our wheelchaircurling blog, BC were firm favourites to win a third successive crown at the 2009 TSX Canadian Wheelchair Curling Championships here in Lower Sackville, Nova Scotia. At the end of round robin play, they sit top of the table with an 8-1 record, and will face 7-2 Alberta in tomorrow's Page playoff 1-2 game. BC began the day facing Chris Daw's Newfoundland & Labrador team in an eagerly anticipated battle between Team Canada skips past and present. In fairness to Daw, he is skipping a team with more potential than experience, and he had done well to coax them to 3-4 record going into the final day. They were no match for the defending champions, though they delivered a scare, posting a 4 to pull within one going into the break. But BC score a succession of big ends and ran out 13-5 winners. BC faced co-leaders Alberta in the final draw, a game delayed for a medical time out when one of the Alberta players was delayed getting onto the ice. While players, coaches and officials all made every effort to accommodate the delay, by rule Alberta were penalised by their clock starting at the end of the official's time out, and losing one point and one end for every five minutes delay. Alberta thus started the game at the top of the 3rd without hammer and down two points. The game was only to choose hammer in the Page 1/2 game, but Alberta fought hard, starting with two steals, but eventually fading to a 6-2 loss. The teams do it all again tomorrow afternoon. Third place Manitoba had an easy win over Quebec in the morning, and then faced Ontario, who needed to win to avoid a tie-break with the northern neighbours. Manitoba had two steals of 2 after the break, and won 7-4 ensuring third place in tomorrow's Page playoff. Northern Ontario had earlier won the second Annual John MacCrae Trophy for top Ontario team. 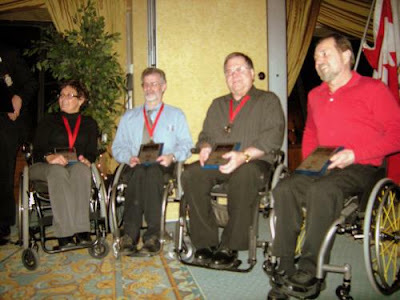 Ex-Ontario coach Bob Pippy writes from Florida that John MacCrae was the long time General Manager of the Ontario Curling Association and a strong supporter of Wheelchair Curling. Northern Ontario could have won a playoff place outright had they beaten Nova Scotia, a game we blogged (replay the commentary here) but they failed to put away a team that has a skip that can throw beautifully under pressure. Nova Scotia stole in the eighth and the extra to win 8-6. 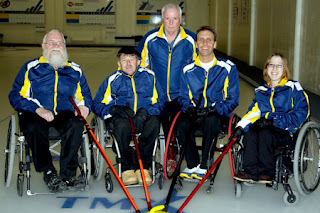 They featured in the only two extra end games; both against Ontario teams. Quebec and Saskatchewan should go home with heads high after winning three games in their first year of competition. Quebec is an especially promising side and youthful, with established athletes from other disciplines who will have learned a lot from this year's intense competition. Their second, Jaques Martin, looks like he could throw a curling stone the length of the sheet without it touching ice, and relegated Chris Daw's biceps to something you could kick sand at. Coach Al Whittier is a great example of what can be done in a very short time with drive and enthusiasm and athletes that want to learn. 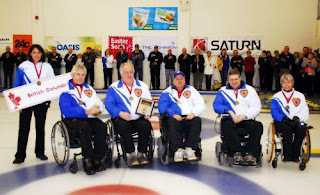 Saskatchewan will return home knowing they scored the biggest end recorded at a Nationals, a 7 in the 4th in their game against Ontario, who had been lying 1 but raised a Saskatchewan stone into the rings, taking out shot stone. I'll say no more in deference to the Ontario coach who threatened to let down my tires if this was mentioned. It will be up to Northern Ontario to upset the bulk of the podium predictions tomorrow. Skip Wayne Ficek promised an early night, and that's something that I can relate to. See you online tomorrow for a rerun of the Battle of Ontario, and coverage of the Page playoffs. There was a side championship scheduled for the week's curling at the 2009 TSX Canadian Nationals - the Ontario Trophy awarded to the winner of the Ontario/Northern Ontario match-up. Northern Ontario were decisive winners, going out to an early 4-0 lead on steals in the second and third ends, and then matching their southern neighbours the rest of the way, wining 8-3. "At least they're the ones who will have to worry about getting the trophy home on the plane,' joked an Ontario coach, but I am sure that will be no bother at all to Wayne Ficek. Northern Ontario had tough opening draws, but felt that if they could hold their record to no more than three losses in the first half, they would be in with a chance at the playoffs by winning the later games. After 7 draws they are in 4th place with games against the two bottom of the table Nova Scotia teams to play. "We only played together for the fist time at the Provincials, and live quite far apart,",explained Ficek. But they are playing as a team, and with Ontario struggling after a promising start, look a good bet to reach the playoff in their first championship. Ontario kept their faltering hopes alive with the tournament's first extra end win over Nova Scotia, 9-8 in the late draw. Skip Ken Gregory was short on his first draw in the eighth end, but managed to come into the rings with his final stone to force an extra. Each side played stones to the front of the house in the 9th, and when Ontario finally came in, sitting shot on the 4-foot, Nova Scotia skip Mike Fitzgerald drew through a narrow port with a final stone that stopped an inch short of victory. Team BC were back on track with a couple of wins, though they were pushed hard by the rookie Saskatchewan side. Their skip, Del Huber, felt they could have won a famous victory had they taken their chances to turn ones into twos, but with three wins already, he can feel proud of his team's showing. That won't satisfy lead Marie Wright, however. She told me the day before the tournament that she wanted a podium place. She won't get one his year, but she hits well enough to have reasonable hopes of a medal before too long. Bc's other game was against challengers Manitoba, who are all business on the ice. A couple of questionable shot calls may have cost them a chance at 3's and you can't afford to make any shot calling mistakes against Jim Armstrong. Manitoba work with an experienced coach most weeks, and play together twice a week and also practice together. That discipline shows on the ice, but today they did not take the few chances they had to score big ends and BC's 3 in the third was decisive in a 6-3 win. Alberta continued to match BC for wins, and posted narrow victories over Quebec 7-6, and Newfoundland 6-4. They are doing just enough to win, and look likely to be challenging BC for hammer in the Page 1/2 game when they meet in the final draw. Newfoundland skip Chris Daw has called on all his considerable experience to bring his all female teammates close to the playoffs, but they have not been able to play consistently enough to mount a real challenge. The consensus among the competitors is that an opening ceremony, full practice, and five draws in two days, plus 90 minutes loading and travel each way, with days starting at 8.30 and ending after 11PM has been too much to handle. Though spirits remain high, bolstered by the warm welcome and supportive energy of wonderful volunteers, fatigue is clearly showing, even on the face of old campaigners like Jim Armstrong. No-one neutral is hoping for tie-breaks. We'll know tomorrow. Join us at 3:30 PM ADT for Draw 7. We expect to be live blogging BC vs MB, but anything can happen with sight lines here. Please join us Wednesday morning at 11:30 AM ADT for Draw 6. We plan to feature BC vs SK. 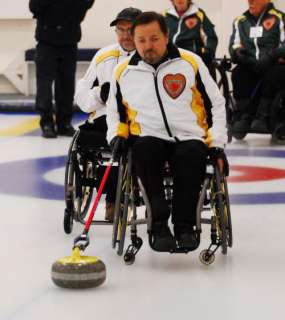 Day 2 of the Canadian National Wheelchair Curling Championship was always going to be a endurance challenge, especially for teams with only four members. The day started at 9:00 AM with an hour and a half of loading and transport to the club, and then three draws, and an hour and a half to get back to the hotel. Everybody looked exhausted as they returned to the hotel well after 11:00 PM. It's not surprising that by the end of the day there were no unbeaten teams, although BC, Alberta and Manitoba, the three teams with the most experience and the most settled sides, ended up top of the table at 4-1. BC started with a comfortable 11-2 win over Nova Scotia, with Frank LaBounty, having issues with his wheelchair, sitting out. At lunch time, coach Melissa Soligo was still trying to decide who would sit out for the afternoon draw. "Having five players is a huge advantage," Jim Armstrong had said prior to the tournament, "especially on the day with three draws." But that still meant that either Whitney or Frank would have to sit if Darryl was to play. It was decided by names out of the hat. I picked the names out of the hat and take full responsiblity for BC's 10-4 loss to Ontario in Draw 4. BC recovered with a tough 9-7 win over Northern Ontario in the evening draw, with Darryl sitting in for Whitney. A very tired looking Jim Armstrong said at the end of the day, "Everything that could have gone wrong on the ice went wrong." But they still have a share of the lead. Manitoba third Dennis Thiessen, at lunch after the morning draw, felt his 3-0 team were where they needed to be to make the playoffs. Despite a tough 6-5 loss to Alberta in the afternoon, Manitoba are 4-1 and have impressed with their steady play. Chris Sobkowicz is looking far happier skipping than he did playing lead at the Worlds. Alberta, after losing 6-5 to Northern Ontario in the morning, beat challengers Manitoba and Ontario to greatly increase their chances of making the Page 1-2 game. With only four team members, we'll see whether they can maintain their momentum. Northern Ontario continue to be the wildcard, capable of beating Alberta and Newfoundland & Labrador, but also losing to Saskatchewan, who posted their first two wins today. Skip Wayne Ficek rued the loss to Saskatechewan, feeling that 3-2, having played the contending teams would have put them in a good position to make the playoffs. "We feel we can still make it if we win out. 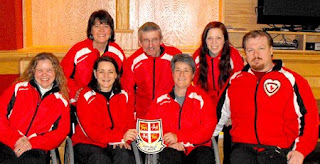 The first time the team played together was at the Northern Ontario playdowns and three members of the team have only been curling a year." 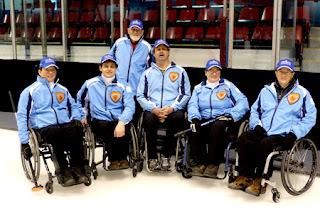 Quebec also posted their first wins today, beating Newfoundland & Labrador 7-5, and the Host team 8-5. Join us for Draw 5 tonight - We'll start the live blogging at about 7:45 ADT. The whole day is running late. We're guessing the play will begin about 8:00 PM ADT, but check in sooner and join the chat. We will feature NS vs SK tonight. 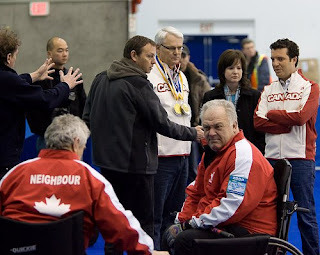 The moment of truth came for the less experienced teams during the first day of play at the 2009 TSX Canadian Wheelchair Curling Championship. There were five double-digit scores posted, and only one game decided on the last rock, when Nova Scotia just failed to overcome an early four-ender, losing 7-6 to Newfoundland & Labrador. In the opening draw defending champions BC played the Nova Scotia Host team in a game where they threw guards rather than running up the12-1 score. Their evening 13-1 win against Quebec was equally decisive. Several of the leads struggled with heavy ice, especially during the 8:00 PM draw of a day that started 12 hours earlier with a 30 minute bus ride in from Halifax. There are four experienced teams at the Championship, and they all won both their opening games. Northern Ontario, annoyed at themselves for not making a better show in a 9-4 loss to Manitoba, took it out on Newfoundland & Labrador in the evening. Newfoundland with Chris Daw at skip had scored an early four in an opening draw against Nova Scotia, holding on for a 7-6 win. Chris declined the excellent dinner that was put on between draws, fearing that it would affect his performance in the evening, but probably should have played on a full stomach, as he was blanked by Northern Ontario, 10-0. Alberta looks strong despite the absence of Anne Hibbard, their second, who is unable to travel because of a hospitalization from a foot injury. Jack Smart, who played third for Team Canada member Bruno Yizek last year, is the very animated skip of this year's team. Alberta's evening draw against Nova Scotia was fought to the bitter end. Down 7, Nova Scotia didn't surrender until they were finally run out of rocks, midway through the end. Ontario posted fives in both of their games. Skip Ken Gregory joked, "We don't play to win; we play to come back." Fives will do that for you. When they face BC in the second of today's three draws, it might be wiser not to play from behind. The organizing committee and the volunteers at the club are a pleasure to work with. A weak computer signal in what is the basement of a sports complex was corrected when someone from the club went out in the snow to purchase 200 feet of extension cable. The food is wonderful. The volunteers are cheerful. And if it wasn't snowing, everything would be perfect. 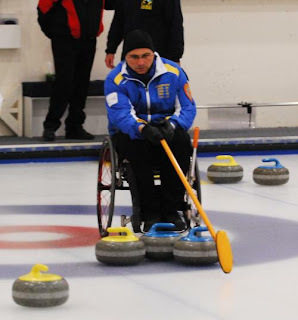 Michael McCreadie skipped a last rock win at the Scottish Wheelchair Curling Championship this past weekend. 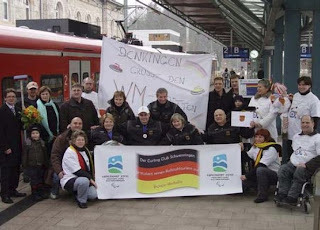 Click here for Curling Today's report. Photo by Judy Mackenzie. We expect to have the connection issues sorted out by 4:00PM Atlantic Time. Here is a link to the event. We're having problems with the internet connection at the Lakeshore Curling Club. Please be patient. We hope to have the problem resolved for the 4PM draw. 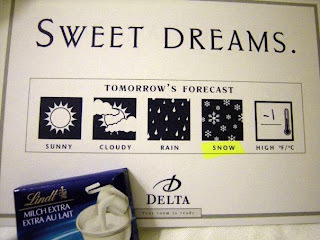 Hello from Halifax, NS, where the little card with the chocolate treat on my pillow tells me that we are expecting snow tomorrow, and a high of -1C. I'm still working on BC time. It's 6:30PM, and Martin and Ferby are about to play in the Canada Cup. But it's an early start tomorrow, or at least that's what I'm telling myself right now. If the Canadian Nationals are as well organized and as sociable as the preliminaries today, it's going to be a fun week. WestJet service was excellent, I was met off the plane, the room was as advertised, there's restaurants and shops without having to go outside in the wind and cold, and did I mention that it's an early start tomorrow morning? Most of the teams got together this evening for munchies and a no-host bar. 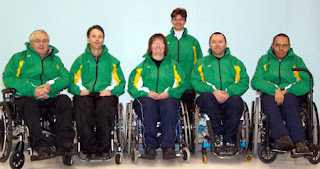 Chris Daw arrived with his retinue of three female teammates, a female coach, and his wife, all wearing tee shirts that say, "Throw like a girl" with a purloined wheelchaircurling.com logo. Everybody seems in good spirits, particularly the Northern Ontarians, still celebrating their win over those big city guys from Thunder Bay. Alberta's Anne Hibberd was unable to travel, having seriously injured her foot. Everybody wishes you well, Anne! And with that, we'll see you online tomorrow for the Opening Ceremonies at 11:00AM Atlantic Time. (Conversion here.) Opening Ceremonies will be followed by team practices, and the first draw at 4:00PM Atlantic Time. We'll be covering defending champions BC, who will be playing the Host team. 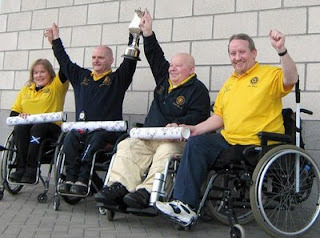 Eight rinks will be competing in Aberdeen this weekend for the 2009 Scottish Wheelchair Curling Championship. Jim Sellar and Michael McCreadie, who played together on the Scots team at the recent Worlds will each skip a side. Angie Malone, who won the British Open in Kinross last November, will also be skipping her team. You can follow the results HERE. Who will make the podium at the 2009 Canadian Nationals? With nine provincial teams and a host team to round out the draw to ten teams, this year's provincial championship will be the largest in the six year history of the sport. Two players, Frank Cannarello of Ontario and Whitney Warren of BC have appeared in every multi-province championship. BC are the only province to have won the title, in 2007 and 2008, with Team Canada winning the first four championships. Team Canada wil not be competing this year, though four of the present eight person squad will appear; Jim Armstrong and Darryl Neighbour with Team BC, Bruno Yizek with Team Alberta, and Chris Sobkowicz with Team Manitoba. Darryl will not expect to play more than a game unless a team member is unavailable. BC, Alberta, and Manitoba bring settled sides who all competed last year. Ken Gregory's Ontario rink finally displaced Toronto's Chris Rees and also brings an experienced team that will expect to be competitive. Nova Scotia, in their second year of competition will have the advantage of home ice and will be looking to build on a very respectable 5th place last year. Northern Ontario's Wayne Ficek surprised last year's Thunder Bay and provincial skip Carl Levesque in bringing his Kenora team through a playdown to win a trip to Nova Scotia. They also supplied the best "don't mess with us" team photo. All those clamouring for Chris Daw to resuscitate his curling career will be following Newfoundland/Labrador with interest. No provincial team has worked harder and come further in just a year than Quebec, and darkhorses Saskatchewan and the Nova Scotia host team round out the field. Post your 1 - 2 - 3 picks in the comments below, and if you are the first correct entry AND you have your name on your post, you'll win a wheelchaircurling.com t-shirt. 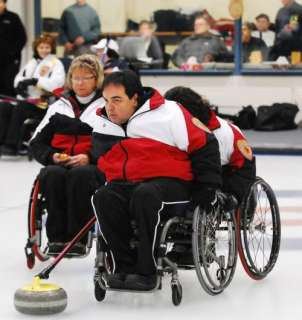 The Nanaimo Bulletin reports: The Nanaimo Curling Club was accessible to everyone earlier this month. 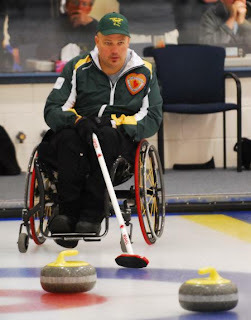 The annual Stixs and Stones wheelchair curling bonspiel was held March 8 at the club, bringing together disabled and able-bodied athletes who all threw their rocks with a cue. Twenty-two people participated and around $350 was raised towards the NCC’s elevator project. Club manager Denise Wood said she will learn later this month if the elevator project qualifies for gaming funds. For those unfamiliar with Rick Mercer, he hosts a nationally televised show The Rick Mercer Report on CBC and available via BitTorrent for those unable to tune in on Tuesdays at 8 pm local time. Mike Fitzgerald and Laughie Rutt triumphed in the Thursday evening stick curling league's championship at the Lower Sackville Lakeshore CC. 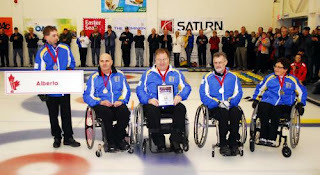 The duo, who will constitute the back end of Nova Scotia's provincial team at the national championships starting March 23rd, were delighted to prevail without sweeping in a league primarily designed for non-wheelchair users. A scheduling conflict means their provincial team duties will prevent them from challenging for the Nova Scotia Stick Curling Championship in Middleton starting March 27th. 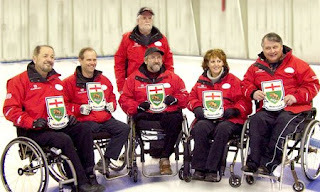 Team Nova Scotia is set for the 2009 TSX Canadian Wheelchair Curling Championship to be held in Lower Sackville starting on March 23rd, 2009. It's an experienced team, all players having had played in last year’s Championship held in Winnipeg. 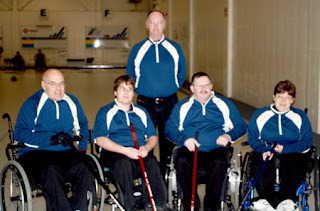 Last year the all rookie Nova Scotia team had a respectable fifth place finish. Fitzgerald is joined by Laughie Rutt at 3rd, Nicole Durand at lead and Trendal Hubley-Bolivar who is playing second after skipping Team Atlantic in last year’s competition. 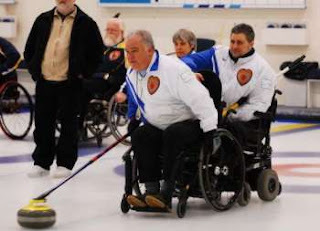 This is the first time the Canadian Wheelchair Curling Championships have been held in Nova Scotia and is the first time that Lakeshore Curling Club in Lower Sackville has ever hosted a national championship event. 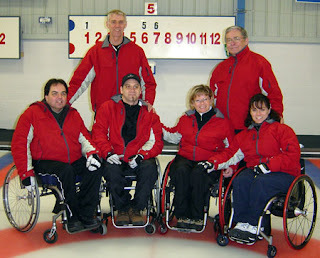 Lakeshore Curling Club is the hub of wheelchair curling in the province. 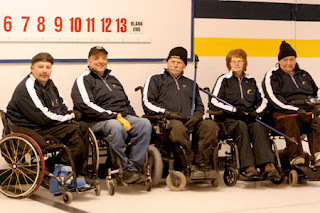 Wheelchair curling in Nova Scotia was founded by Canadian Paraplegic Association (Nova Scotia) and is still supported by the Association, Lakeshore Curling Club and the Metro United Way. Jim Armstong makes the list of six Paralympians to watch in today's Globe & Mail. ""We are the defending champions from 2006. When you're dealing with curling, and talking Canada, it's like saying you're a hockey player. I'd say you're looking at disappointment if you're not looking at a gold medal. 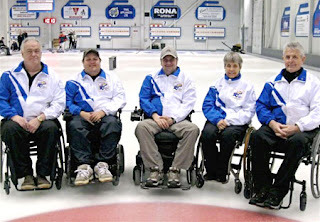 I call wheelchair curling the 'roller derby' of the sport. We don't have the big weight-hits or the sweeping. It's much more interesting, strategically. The able-bodied game is so sterile, with the perfect rocks and the players so good ... they had to change the rules to make it interesting." There were 119 comments on the February 13th post inviting people to guess who would make the Worlds podium, and only one person who chose Canada to win and also correctly suggested that Germany would finish 3rd. Anonymous poster, take a bow. Next closest were two posters suggesting that Canada would win and Sweden place 3rd. My prediction of a Canada win and a USA 3rd looked good until ... well watch this video to see what happened.